Amountsee price in store* Quantity 5 oz. 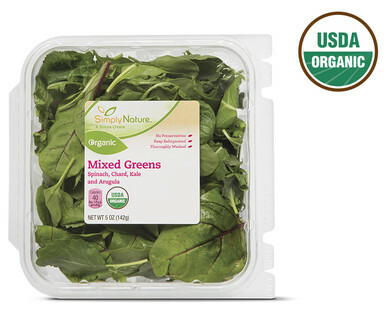 SimplyNature Mixed Greens are high in nutrients and low in calories, making this an ideal nutrient dense food. Mixed greens are an excellent source of vitamin A, which helps form and maintain healthy skin, teeth and eyes. Each leaf is packed with vitamin C that acts as an antioxidant and supports the body’s immune system. Every package has a load of vitamin K tossed in, which supports heart and bone health. In general, darker colored leaves contain more nutrients than their lighter counterparts.